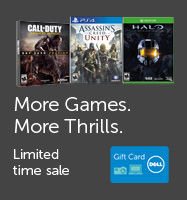 Dell Home has a free $25 promotional eGift card Call of Duty Advanced Warface, Assassin's Creed Unit, Halo, GTA Sale through 10/2 7am CT. - Free Shipping. Also covers other huge preorders. Gift card shows up in your cart.